Baker, D. (1994) Utilization of precursors for l-amino acids. In: D'Mello, J.P.F. (ed.) Amino Acids in Farm Animal Nutrition. CAB International, Wallingford, UK, pp. 37-61. Barouch, L.A., Harrison, R.W., Skaf, M.W., Rosas, G.O., Cappola, T.P., Kobeissi, Z.A., Hobai, I.F., Lemmon, C.A., Burnett, A.L., O'Rourke, B. Rodriguez, E.R., Huang, P.L., Lima, J.A.C., Berkowitz, D.E. and Hare, J.M. (2002) Nitric oxide regulates the heart by spatial confinement of nitric oxide synthase isoforms. Nature 416, 337-340. Bäsch, J.J., Wickham, E.D. and Farrell, H.M. (1997) Arginase in lactating bovine mammary glands; implications in proline synthesis. Journal of Dairy Science 80, 3241-3248. Bradford, H.F. (1986) Chemical Neurobiology. W.H. Freeman, New York, 507 pp. D'Mello, J.P.F. (1991) Toxic amino acids. In: D'Mello, J.P.F., Duffus, C.M. and Duffus, J.H. (eds) Toxic Substances in Crop Plants. The Royal Society of Chemistry, Cambridge, pp. 21-48. Harper, A.E., Miller, R.H. and Block, K.P. 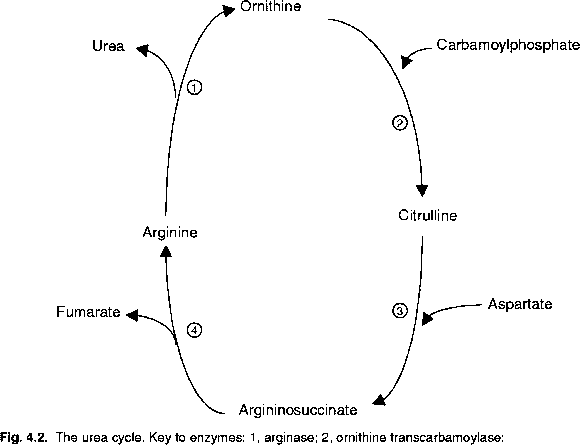 (1984) Branched-chain amino acid metabolism. Annual Review of Nutrition 4, 409-454. James, B.W., Goodband, R.D., Unruh, J.A., Tokach, M.D., Nelssen, J.L., Dritz, S.S., O'Quinn, P.R. and Andrews, B.S. (2002) Effect of creatine monohydrate on finishing pig growth performance, carcass characteristics and meat quality. Animal Feed Science and Technology 96, 135-145. Lacasse, P.V.C., Farr, S.R., Daws, S.R. and Prosser, C.G. (1996) Local secretion of nitric oxide and the control of mammary blood flow. Journal of Dairy Science 79, 1369-1374. Nieto, R., Obitsu, T., Fernandez-Quintela, A., Bremner, D., Milne, E., Calder, A.G. and Lobley, G.E. (2002) Glutamine metabolism in ovine splanchnic tissues: effects of infusion of ammonium bicarbonate or amino acids into the abomasum. British Journal of Nutrition 87, 357-366. Onoda, M. and Inano, H. (1998) Localization of nitric oxide synthase and nitric oxide production in the rat mammary gland. Journal of Histochemistry and Cytochemistry 46, 1269-1278. O'Quinn, P.R., Knabe, D.A. and Wu, G. (2002) Arginine catabolism in lactating porcine mammary tissue. Journal of Animal Science 80, 467-474. Piva, A., Prandini, A., Fiorentini, L., Morlacchin, M., Galvano, F. and Luchansky, J.B (2002) Tributyrin and lactitol synergistically enhanced the trophic ststus of the intestinal mucosa and reduced histamine levels in the gut of nursery pigs. Journal of Animal Science 80, 670-680. Rosenquist, T.H. and Finnell, R.H. (2001) Genes, folate and homocysteine in embryonic development. Proceedings of the Nutrition Society 60, 53-61. Seal C.J. and Parker D.S. (2000) Inter-organ amino acid flux. In: D'Mello, J.P.F. (ed.) Farm Animal Metabolism and Nutrition. CAB International, Wallingford, UK, pp. 49-63. Stabler, S.P., Lindenbaum, J. and Allen, R.H. (1996) The use of homocysteine and other metabolites in the specific diagnosis of vitamin B-12 deficiency. Journal of Nutrition 126, 1266S-1272S. Wu, G., Pond, W.G., Flynn, S.P., Ott, T.L. and Bazer, F.W. (1998) Maternal dietary protein deficiency decreases nitric oxide synthase and ornithine decarboxylase activities in placenta and endometrium of pigs during early gestation. Journal of Nutrition 128, 2395-2402.